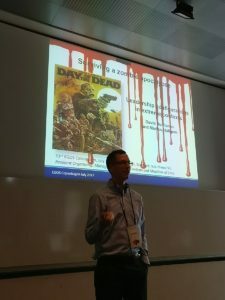 Extreme contexts at EGOS and presentation on Zombies! » Triple E.D. This is intended to be a short reflection on the activities today at EGOS. Together with professor Samer Faraj at McGill university (Canada) and professor Daniel Geiger (Hamburg University, Germany) I (Markus) convene a track on resilient organizing in extreme contexts and crisis at this years EGOS in Copenhagen, Denmark. As things have turned out it was one of the most popular tracks of the entire conference. The room that we are in sits about 45 people and it is absolutely packed. Starting of the track this morning it was marvelous to see how excited people were about the track. From the go-around in the presentations we could also hear that it was truly an interest in the topic that had drawn these people together. 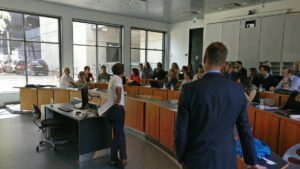 The first day went down well where the first to presentations was about managing drift, and managing meaning as a way to cope with constant adverse events in the case of adventure racing (Barton & Sutcliffe). The second paper shared the interest, but focused more on how to develop high reliability organizations in political conditions – seen not as outliers, but prototypes given how the world is developing as of today (Brown, Colville & Pye). This entry was posted in Extreme contexts, Just for fun, New case, Presentations, Qualitative methods, Zombies. Bookmark the permalink.